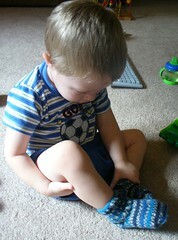 I finished Max’s second sock, and he looooooves them. I think he’s just been waiting for me to finish them. 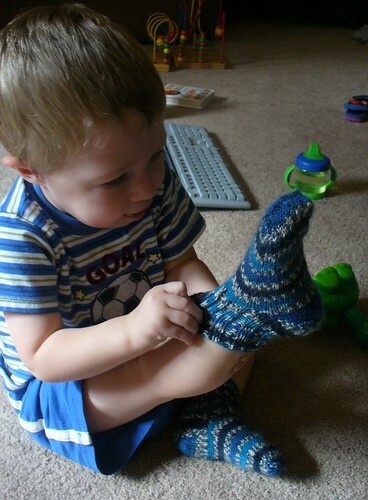 He liked trying them on while they were on the needles, and this morning when I asked him if he wanted to try on his new socks, he practically launched himself onto the sofa beside me. They came out a little big for him – but that’s fine. His feet are obviously not done growing. It’s just as well, really, the bindoff is a little tight for the ribbing. I used a suspended bindoff because it claims to be elastic and therefore perfect for finishing off ribbing (according to the Reader’s Digest Complete Guide to Needlework) but it’s still a bit tight. How do the cool kids finish off their ribbing? Anyway, while attempting to photograph both of his feet together, I noticed a run (!) in the ribbing on one sock. Is it possible to drop a stitch after binding off?!?!? Logically, I assume that I missed a stitch while working the bindoff. I stole the sock from his foot (over his protests) and retrieved the stitch with my trusty F hook while Max stood by the sofa bouncing impatiently and repeating “Sock pleeeeeeeease!” (Technically, it was “oksh eeeeeeeee”) and tried to take it from me while I was retrieving said dropped stitch. -_- Anyway, I have no idea how to incorporate a dropped stitch into something I’ve already bound off and have no intention of un-binding and reworking, so I just sewed the loop (securely!) to the inside of the bound-off edge where it is now behaving itself. He won’t give the socks back. 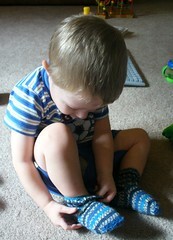 They look great and he is adorable-even better, he loves them! SO cute! I must have the pattern for my DS. And I love that train cake! Cute cute socks. They are adorable. And well recieved too. What cute socks! (And a cute lil’ boy, too.) He definitely looks like he loves them!